I've not died. Or given up knitting. I've just been busy. I've had marking, lecturer training, seminars to go to, a seminar to write, a chapter draft to finish and things to do for a conference I'm organising. But now, at last, I have a day off. The marking is done. The chapter draft isn't, but it's at a stage where it needs to be left for a day. I have coffee, I have porridge. I have a vintage Dr Who DVD and it's a lovely sunny day so I think I'll go for a bit of a walk up to the Horniman. And the knitting? I have been doing some, but it's still at that dull WIP stage. 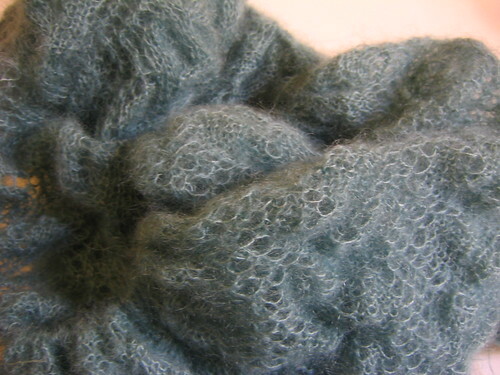 This big pile of fluff is the edging for the print o'wave stole. And this? This is a hint of a Cheshire Cat. First one done, second is a good 1/8th of the way in. 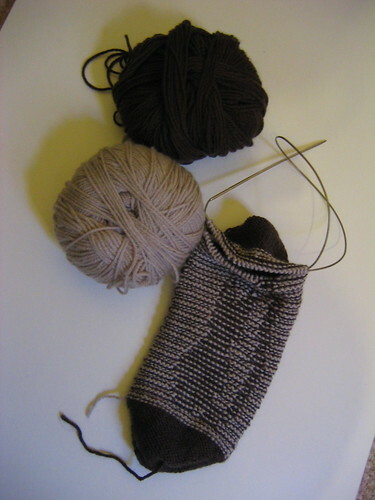 I'm going to change the ears and tail slightly for the second sock (and final pattern) but it'll do. While my big WIP projects are progressing pretty slowly, I squeezed this out. It's a ball of 4ply tweed I got cheap because it was a funny dye-lot. 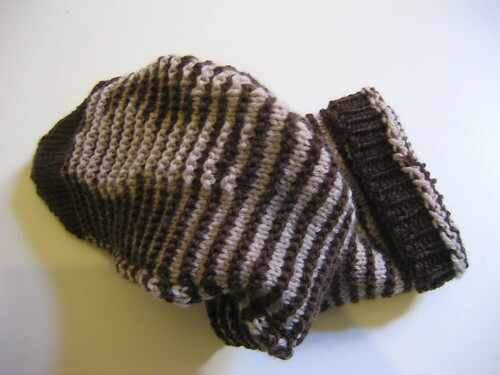 I just knitted a st st tube, folded it for double thickness, kitchenered up the end and threw it in the washing machine. 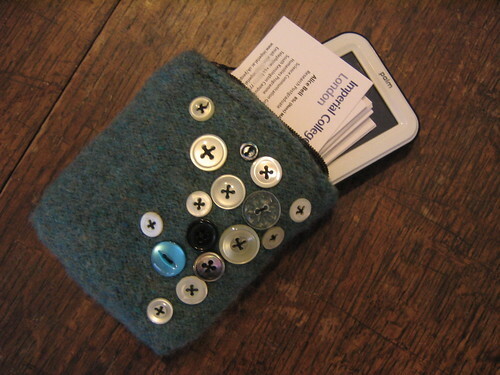 Once felted I sewed the zip and a few decorative buttons. Done. Perfect size for my pda and a few business cards. An evening's knitting, an evening's sewing. It was my birthday yesterday, and my lovely BF made me a cake. 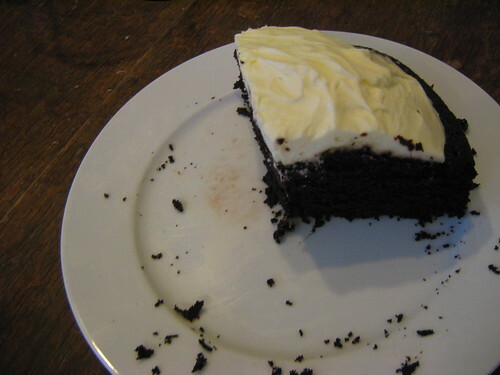 A chocolate Guinness cake (recipe in Feast). As you can tell from how much was left by the time it was light enough to take a photo, it's good cake. * We don't use the KAL acronym in this house, my flatmate, who's initials are KAL won't allow it. ** Bosoms, that's a great word. People should use it more. Bosoms. I'm going to have some odd traffic here through search engines now, aren't I? These aren't bland sweeties, but the white crosses balance the delightfully dark, spicy balls underneath. Plus, unlike most truffles they don't contain cream so they're not too rich (and should last a bit longer - if you let them!). 200-250g ginger cake crumbs (I blitzed a Jamaica Ginger Cake in a food processor). 50g crystallised ginger, finely chopped. A generous teaspoon of ground ginger, more if you really want a kick (you could add a pinch of pepper or tiny bit of chili for real heat). 200g good quality dark chocolate (70% cocoa). 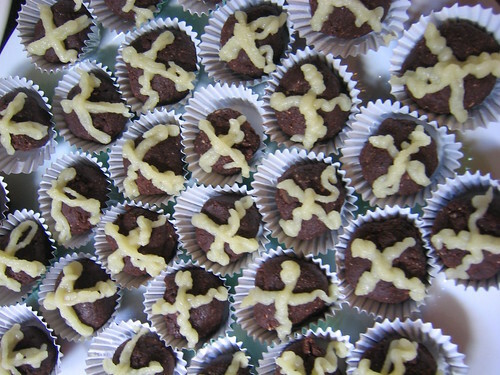 Small amount of marzipan thinned down with water to a pipe-able almond paste OR melted white chocolate OR other white frosting to make the crosses. Mix the dry ingredients while you gently melt the chocolate. Gradually mix the dry ingredients INTO the melted chocolate, to make a smooth and even, but dense paste. Roll into balls and place in small cases. DO NOT leave them in the fridge before making them into balls (as you would with truffles - this recipe doesn't have the cream and butter). Using your choice of icing, make crosses on the the tops, al la hot cross buns. I made my own thin almond paste with left over ground almonds, a bit of water and a few drops of almond essence and piped them on with a sandwich bag - I'm sure a more experienced cake-icer armed with proper equipment could do a neater job! 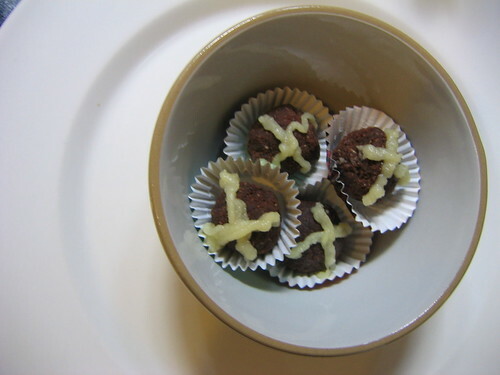 Inspired by this recipe for xmas pudding truffles, though I think my spicy version would suit that season too. They went down really well today at family lunch, I may well make some more for Marcus' family next week. I also managed a batch of real hot cross buns. I used Hugh Fearnley Whittingstall recipe from the Guardian, modifying his tutti-frutti for some tea-soaked raisins and substituting milk and butter for dairy-free options. A very yummy Easter all round. Tail aside, I know it looks more like a rabbit than a cat, but trust me, illusion-wise (i.e. the right way around, looking at an angle to see the picture through the bumps and valleys of purls and knit-stitches) it's a cat. Took FIVE times to get it right. But it looks like cat, and is small enough to fit on feet smaller than mine, even at sportweight (which I believe cashsoft 4ply really is, much heavier than a standard 4ply).